My book Habitat ’76 will be out soon (Black Dog Publishing, London—pre-order here or preferably with your local bookshop). The book is a comprehensive illustrated history of the UN Habitat Conference on Human Settlements in Vancouver, 1976. It covers both the official UN conference and the parallel Habitat Forum event, and contains hundreds of photographs (many never before seen) and many interviews with Habitat ’76 alumni. Habitat I was the first time the global community had come together in a substantial way to discuss cities & all human settlements: the growing challenges of urbanization, rising inequality, the accelerating human migration from rural to urban areas, urban problems including clean water, sanitation, poverty and homelessness, as well as the nascent field of sustainable urban development and design. Did they have the right idea in 1976 at Habitat? That is one of the questions the book asks in its final chapter. This website is part of an extended research project for the book and a vehicle for locating Habitat I alumni and building an archive. For those unfamiliar with the UN-Habitat agency, it is responsible for ensuring cities are more equitable and sustainable. Major UN Habitat conferences happen every 20 years. Habitat 1 was in Vancouver; Habitat II was held in Istanbul in 1996; and Habitat III is taking place in Quito now, October 2016. Below: original Habitat ’76 conference posters. I have reproduced the first one exactly as the original, and if you are at Habitat III and want to buy one, contact me. Habitat Forum, and its parent event the United Nations Habitat Conference on Human Settlements, took place in Vancouver, Canada from May 31-June 11, 1976. The conference was also known as “Habitat I” and it provided the foundation for the United Nations’ agency known as UN Habitat (though technically it was only officially opened two years later in 1978). The conference was advised by one of the founders of the field of sustainable development, the economist Barbara Ward, and it was attended by such names as Margaret Mead, Mother Teresa, Buckminster Fuller, Paolo Soleri, Maggie and Pierre Trudeau and many others, and by key housing and slum activists from around the world. This site exists to both share a portion of the growing Habitat archive and to encourage the community to contribute their own Habitat materials—memories, stories, photographs, film, memorabilia—in the service of producing a comprehensive public memory of this formative event. If you would like your material to be part of the book, and be credited in it, or better yet interviewed for it, please contact me. The full extent of the archive won’t be shown here—it will be collected in the book—but keep checking back for new additions. Above: Habitat Forum’s theatre was a vintage seaplane hangar transformed by a massive mural designed by renowned Haida artist Bill Reid. The building, along with the four other hangars refurbished for Habitat, was demolished by 1980 (same site today, below). Above (3 photos): Not strictly part of Habitat Forum, but clearly consistent with its spirit, was the environmentally friendly Paper Pavilion by Arthur Erickson for Habitat. 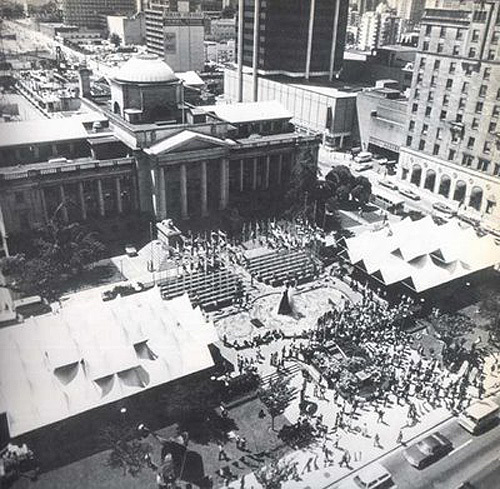 A very early example of paper architecture, the pavilion’s papier mache panels were made by Vancouver schoolchildren and then assembled into this structure on the Vancouver Courthouse’s North plaza (now the Vancouver Art Gallery).